Take a drive to the end of tree lined Plush Mill Road in Wallingford and get a glimpse into one of Delaware County’s most historic and interesting propeties. This place is so full of interesting nooks and crannies, I’m not sure what I like the best! Visitors know this property as the site of the Community Arts Center, but during the late 1800s, this three story stone mansion and six acre estate was the summer residence of wealthy mill owner Henry Dixon and his wife Ida Dixon. As you enter the building, you see a fireplace flanked by two rooms-one is used for meeting space and the other the gift shop. The beautiful wood paneling and molding has been preserved and serves as the perfect backdrop to showcase local artwork. 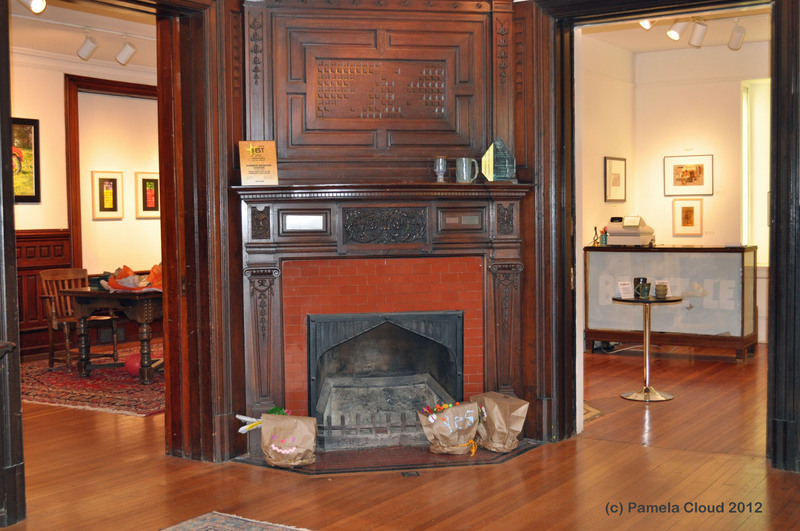 Lobby of Community Art Center featuring one side of a 3-sided fireplace! The Community Arts Center is a vibrant and exciting fixture in Wallingford, and has been for thirty years. 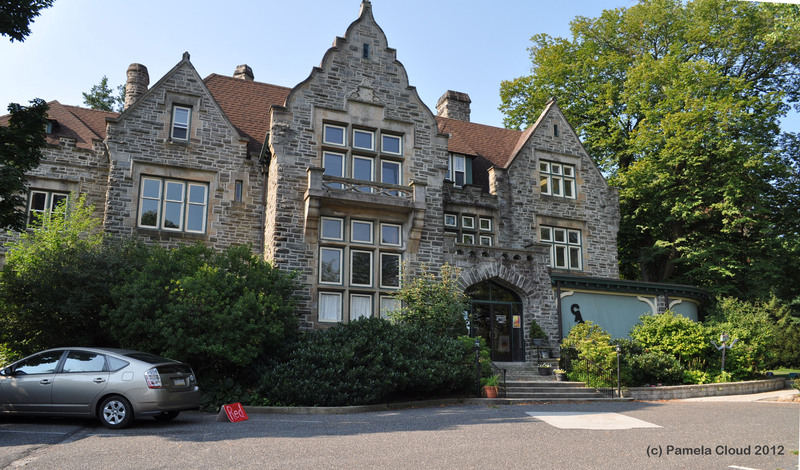 The mansion is used as gallery, office & classroom space, a venue for events and also is home to a retail store showcasing the work of local artisans. Discriminating shoppers can find unique and one-of-a-kind gifts in Bedazzle. The grounds of the former estate serve as playground, including nature trail, vegetable garden and has space specifically devoted to children’s artistic creations. If you are an artist or an art lover, this is the perfect place to take a stroll-inside or out. The art center offers classes to adults and children year round from drawing to pottery. In summer, the art center is home to Summer Spree, a wonderful art camp for children. What better place to feed the artistic brain than an old mansion adorned with wood paneling, carvings, Mercer tiled fireplaces, gardens and more? It is a magical time for children, who are taught by experienced artists and also spend time outdoors exploring the magical grounds of this grand estate. The summer session just ended, but if you are looking for something different for your child next year, it’s definitely worth looking in to. The former ballroom features two fireplaces, wood-shuttered windows and at one time accomodated a pipe organ and small orchestra. 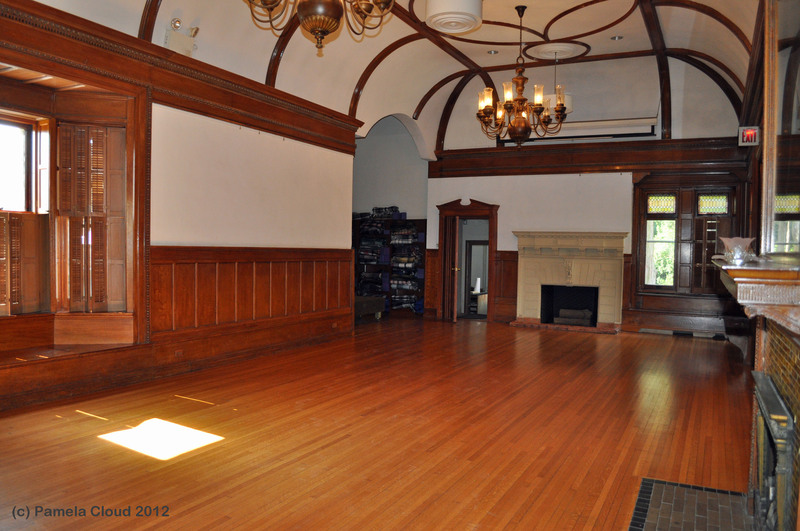 The former ballroom is used as a yoga studio, meeting space and a great venue for special occasions. Call the arts center for availability. There was once a carriage house that also accomodated a billiards room and maids quarters above. Once automobiles came into fashion, a garage was built. The garage now serves as a pottery studio for the Potters Guild. 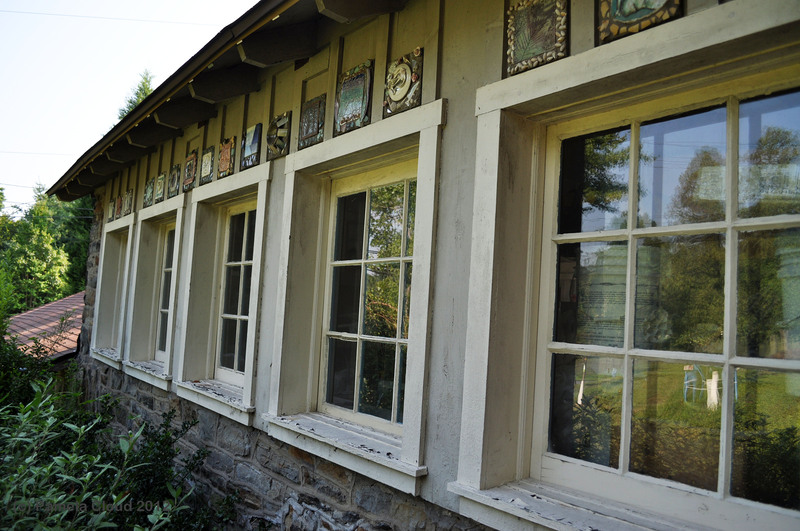 Custom tiles decorate the windows of the studio, providing an outdoor gallery of inspiration to admirers. Former Garage, now used as a ceramic studio by the Potters Guild. The Community Arts Center is much more than a place to take art classes. It hosts public events, shows and more. Here are some additional photos, but the Community Arts Center is best experienced in person. Come take a look for yourself! About Wallingford: Wallingford Pennsylvania is located in Nether Providence towship, just minutes from downtown Media and is served by Wallingford-Swarthmore School District. There are currently 58 active listings in Wallingford, with an average prices of $380K, based on a search for single family homes in Trend MLS for August 22, 2012. In the past three months there have been 42 sold properties with an average sale price of $354K. If you would like so search for homes in Wallingford or find out what your home is worth, Click here or call me directly at 484-883-8231 or email: pamcloud@kw.com.